^ （英文） Robert Conquest. Reflections on a Ravaged Century [對一個被蹂躪的世紀的思考]. 2000: 74. ISBN 0-393-04818-7. ^ （英文） Carl Schmitt. The Concept of the Political [政治的概念]. 1927: 22. ^ （英文） Andrew Defty. Britain, America and Anti-Communist Propaganda 1945-1953: The Information Research Department [1945-1953年，不列顛、美利堅與反共宣傳：信息研究部門]. 2007. ^ （英文） David Caute. Politics and the novel during the Cold War [政治學與冷戰期間的小說]. 2009: 95–99. ^ （英文） George A. Reisch. How the Cold War transformed philosophy of science: to the icy slopes of logic [冷戰怎樣影響了科學哲學：邏輯學的冰冷斜面]. 2005: 153–154. ^ （英文） Paul Preston. The Spanish Civil War: reaction, revolution and revenge - 3rd edition [西班牙內戰：反動、革命與復仇 - 第3版]. W. W. New York, New York, USA: Norton & Company, Inc. 2007: 64. ^ 9.0 9.1 9.2 （英文） Richard Pipes. 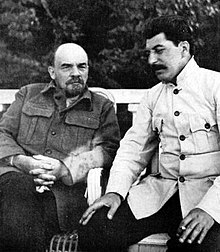 Russia Under the Bolshevik Regime [布爾什維克政權統治下的俄國]. New York: Vintage Books, Random House Inc. 1995: 240–281. ISBN 0-394-50242-6. ^ （英文） Stanley G. Payne. Fascism: Comparison and Definition [法西斯主義：對比與定義]. 華盛頓大學出版社. 1980: 73. 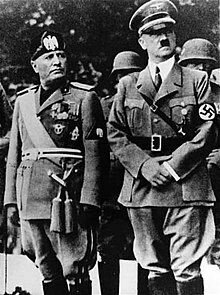 ^ （意大利文） Gentile, Giovanni and Benito Mussolini in La dottrina del fascismo [法西斯主義的教條 - 「喬瓦尼·秦梯利與本尼托·墨索里尼」章節]. 1932. ^ （英文） Robert Conquest. The Great Terror: A Reassessment [大恐怖：重新評判]. 牛津大學出版社. 1990: 249. ISBN 0-19-507132-8. ^ （英文） Virgil Nemoianu. Review of End and Beginnings [《评〈结束与开始〉》]. 1982: 1235–1238. ^ （英文） Friedrich Hayek. The Road to Serfdom [通往奴役之路]. 芝加哥大學出版社: 62. 2009-05-15 [2014-04-24]. ^ （英文） Friedrich Hayek. The Road to Serfdom [通往奴役之路]. Psychology Press: 11-12. 1944 [2014-04-24]. ^ （英文） Walter Laqueur. The Fate of the Revolution: Interpretations of Soviet history from 1917 to the Present [革命的命運：對蘇聯從1917年至今歷史的解讀]. Scribner's（紐約）. 1987: 131. ^ 17.0 17.1 （英文） Bholanath Dutta. International Business Management (Text and Cases) [國際商業管理（理論與實例）]. Excel Books India. 2010: 86. ISBN 978-81-7446-867-3. ^ （英文） Dana Richard Villa. The Cambridge Companion to Hannah Arendt [劍橋之友系列叢書 - 漢娜·阿倫特]. 劍橋大學出版社. 2000: 2-3. ISBN 0-521-64571-9. ^ （英文） Arnold M. Ludwig. King of the Mountain: The Nature of Political Leadership [高山之王：政治領導的本質]. 肯塔基大學出版社. 2002: 412 [2014-04-24]. ISBN 978-0-8131-2233-5. ^ （英文） Christine Barbour, Gerald C. Wright. Keeping the Republic: Power and Citizenship in American Politics [讓共和制度持續：美國政治中的權力與公民意識]. Cq Press. 2008-12-01: 14 [2014-04-24]. ISBN 9780872896024. ^ （英文） James J. F. Forest. Countering Terrorism and Insurgency in the 21st Century: International Perspectives, Volume 2, Combating the Sources and Facilitators [在21世紀反擊恐怖主義與暴亂：國際觀點 - 第2冊 - 與根源和誘導者鬥爭]. ABC-CLIO. 2007: 77 [2014-04-24]. ISBN 978-0-275-99036-7. ^ （英文） Gino Germani. Authoritarianism, Fascism, and National Populism [威權主義、法西斯主義與國家民粹主義]. Transaction Publishers. 1978-01-01: 77-78 [2014-04-24]. ISBN 0-87855-642-7. ^ 24.0 24.1 （英文） Achim Siegel. The totalitarian paradigm after the end of Communism: towards a theoretical reassessment [共產主義終結后的極權模範：接近一個理論上的重新評定]. Rodopi. 1998: 13 [2014-04-24]. ISBN 90-420-0552-1. ^ 25.0 25.1 （英文） Ian Kershaw. The Nazi Dictatorship: Problems and Perspectives of Interpretation [納粹獨裁：詮釋的問題與觀點]. Arnold（倫敦）. : 25. ^ （英文） Walter Laqueur. The Fate of the Revolution: Interpretations of Soviet history from 1917 to the Present [革命的命運：對蘇聯從1917年至今歷史的解讀]. Scribner's（紐約）. 1987: 241. ^ （英文） Eric Hoffer. The True Believer: Thoughts on the Nature of Mass Movements [狂熱份子：论群众运动的本质]. Harper Perennial Modern Classics. 2002: 61、163. ISBN 0-06-050591-5. ^ （英文） Walter Laqueur. The Fate of the Revolution: Interpretations of Soviet history from 1917 to the Present [革命的命運：對蘇聯從1917年至今歷史的解讀]. Scribner's（紐約）. 1987: 186-189、233-234. ^ （英文） Lorenz, Chris, "Broszat, Martin" in Boyd, Kelly, ed. The Encyclopedia of Historians and Historical Writing - vol. 1 [歷史學家與歷史寫作百科 - 第1冊]. Fitzroy Dearborn Publishers（倫敦）. 1999: 143-144. ^ （英文） Ian Kershaw. The Nazi Dictatorship: Problems and Perspectives of Interpretation [納粹獨裁：詮釋的問題與觀點]. Arnold Press（倫敦）. 2000: 45-46. ^ （英文） Menke, Martin, "Mommsen, Hans" in Boyd, Kelly, ed. The Encyclopedia of Historians and Historical Writing - vol. 2 [歷史學家與歷史寫作百科 - 第2冊]. Fitzroy Dearborn Publishers（倫敦）. 1999: 826-827. ^ 32.0 32.1 （英文） Walter Laqueur. The Fate of the Revolution: Interpretations of Soviet history from 1917 to the Present [革命的命運：對蘇聯從1917年至今歷史的解讀]. Scribner's（紐約）. 1987: 225-227. ^ （英文） Walter Laqueur. The Fate of the Revolution: Interpretations of Soviet history from 1917 to the Present [革命的命運：對蘇聯從1917年至今歷史的解讀]. Scribner's（紐約）. 1987: 225、228. ^ 34.0 34.1 （英文） Walter Laqueur. The Fate of the Revolution: Interpretations of Soviet history from 1917 to the Present [革命的命運：對蘇聯從1917年至今歷史的解讀]. Scribner's（紐約）. 1987: 228. ^ （英文） Walter Laqueur. The Fate of the Revolution: Interpretations of Soviet history from 1917 to the Present [革命的命運：對蘇聯從1917年至今歷史的解讀]. Scribner's（紐約）. 1987: 233. ^ （英文） Christina Shelton. Alger Hiss: Why He Chose Treason [阿爾傑·希斯：爲什麽他選擇叛國]. Simon and Schuster. 2013-04-23: 162 [2014-04-25]. ISBN 978-1-4516-5543-8. ^ （英文） 本·麥金泰爾. Look on those monuments to megalomania, and despair [透過那些紀念碑，看見妄尊自大與絕望]. 泰晤士報. 2007-03-30 [2010-01-05]. ^ （英文） Richard Shorten. Modernism and Totalitarianism: Rethinking the Intellectual Sources of Nazism and Stalinism, 1945 to the Present [現代主義與極權主義：重新思考1945年至今納粹主義與斯大林主義的智力源泉]. Palgrave Macmillan. 2012-11-16: 160-161 [2014-04-24]. ISBN 978-0-230-25206-6. ^ （英文） Stefan Larsson. Metaphors and Norms - Understanding Copyright Law in a Digital Society [隱喻和準則 - 在一個數位社會中理解版權法律]. Lund University. 2011: 116 [2014-04-24]. ISBN 91-7267-335-4.